Born on September 10, 2006, Renesmee Carlie Cullen (pronounced Ruh-NEZ-may) is a vampire/human hybrid member of the Olympic coven. She is the daughter of Edward Cullen and Bella Swan, and the imprintee of Jacob Black. On the paternal side, Renesmee's biological grandparents are Edward and Elizabeth Masen, while on the maternal, they are Charlie Swan and Renee Dwyer. She is also the adoptive granddaughter of Carlisle and Esme Cullen and the adoptive niece of Jasper and Rosalie Hale and Alice and Emmet Cullen. Renesmee is considered to be Edward and Bella's "miracle", because of what it took to keep her and her mother alive through the pregnancy. Renesmee also has the special power to show people what she is thinking by touching them. In the beginning, Bella gets angry at Jacob for giving her daughter the nickname "Nessie". After Jacob Black imprints on Renesmee, Irina of the Danali Coven sees Renesmee and believes she is an immortal child, a human child who had been turned by a vampire. She informs the Volturi, as immortal children are not permitted to live. The Volturi reach Forks intent on killing Renesmee and the Cullens. However, the Cullen family members gather witnesses from around the world to prove that Renesmee is not an immortal child. Alice brings another half-breed, Nahuel, who explains that half-breeds pose no danger to the vampires. Convinced that Renesmee is not a threat, the Volturi leave, and Renesmee and her family are left in peace. "Her name is Renesmee. Like Renée and Esme put together." 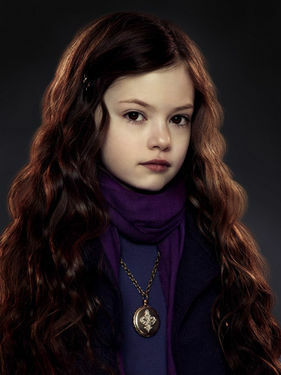 r full name is Renesmee Carlie Cullen. Jacob Black gives her the nickname "Nessie" because he says her full name is a "mouthful". At first, Bella refuses to use this nickname because of the obvious allusion to the Loch-Ness Monster, but by the end of the story she eventually warms to it. The nickname and Jacob's imprinting on her made newborn Bella furious enough to attempt to attack him. Luckily for him, and to Renesmee's relief (as she later tells Bella), Seth Clearwater, Jacob's friend and right hand, jumped in the way, breaking his shoulder and collar bone in the process (which Bella quickly apologizes for after calming down). that Edward, with his ability to read thoughts, thinks of a solution. The Cullens allow Bella to sample some donated human blood from Carlisle's work at the hospital. To Bella's surprise, it smells and tastes appealing, and revives her, to an extent. Jacob however is not so thrilled. Besides the strength and appetite of the growing baby, evidence of its vampire heritage is apparent in the hard and thick amniotic sac, resembling the skin of a vampire, making ultrasounds and amniocentesis impossible. Bella isn't the only suffering individual during the pregnancy; Jacob describes Edward as a "burning man", lifeless and self-loathing, thinking of the child as a possible case of "Rosemary's Baby": a child born of a demon, the spawn of the devil. Edward still is not completely convinced that he is not a monster and that he does have a soul. As Bella's pregnancy nears its completion, Edward discovers he can hear the baby's thoughts; he quickly realizes that the baby loves Bella, can recognize the sounds of its parents' voices, and can even understand simple conversation. This new knowledge quickly wins over Edward's affection (Jacob Black states that Edward cannot hate anyone who loves Bella). After listening to the parents, the baby understands what hurts her mother and tries to avoid injuring her further. Bella is convinced that the baby is a boy and calls it "EJ" (which is short for "Edward Jacob"). However, she does admit that she may be wrong and the baby could turn out to be a girl. She decides that "Renesmee Carlie" would be what she would call her baby, should it be a girl (with the latter being a portmanteau of Charlie and Carlisle, the grandfathers' names). The pregnancy continues its rapid progression, and Bella goes into violent labor even sooner than anticipated when the placenta is unexpectedly detached. Carlisle and Esme, who originally planned to be there for delivery the next day, are out hunting, so Edward, Rosalie, Jacob, and Alice help to deliver the baby by C-section. Although Edward wants to wait for the morphine to spread and ease Bella's pain, Bella commands him to perform the C-section without delay, thrashing and screaming that "He can't breathe!". Rosalie starts the C-section but, due to the amount of blood involved, loses control, forcing Jacob and Alice to tackle and drag her from the room (though Rose retains enough control to not resist). Edward continues with the C-section in Rose's place, eventually using his teeth to bite through the hard amniotic sac. Bella is severely injured during the birth due to the baby's violent thrashing, breaking many ribs, losing a lot of blood, and eventually snapping her spine, which requires Jacob to provide CPR to keep her breathing. After removing the child, Edward hands the baby to Rosalie (who returned after she regained her self-control), who brings her to Bella. It is then revealed that, despite Bella's certainty that the child would be a boy, it was a girl, Renesmee. As Bella holds her, Renesmee's vampire heritage become apparent when she bites Bella, showing her inherited sharp teeth and natural desire for human blood. As Bella loses consciousness again due to her injuries, Edward injects his venom into her heart and bites her in several places, maximizing her odds of survival. After every bite, he runs his tongue over the wound and heals it, trapping the venom into her bloodstream and preserving her already low blood supply. Despite Jacob's CPR support and Edward's venom, Bella's heart stops beating. Believing Bella is beyond saving, Jacob follows Renesmee, intent on killing her in revenge. Still with Bella, Edward provides CPR himself which, combined with the venom, eventually results in Bella's heart recovering, and her conversion into a vampire. Jacob Black, previously determined to destroy the monster which he believed to have killed Bella, imprints on baby Renesmee as soon as he sees her. Renesmee becomes the key to a truce between the werewolves and the vampires; other werewolves would not hurt her because of pack traditions, preventing harm to the object of a pack member's imprintee. Renesmee is very possessive of Jacob, thinking of him as her Jacob (Edward says this is because Jacob tastes better than anyone else). It is stated that she loves her parents as much as she loves Jacob, even before officially meeting Bella and Edward, or even being born. Renesmee grows at an exceptional pace, mentally and physically, forming full sentences mere days after her birth. At the end of the book Nahuel, the human-vampire hybrid the Cullens have just met, states that she will probably reach complete physical maturity around seven years after birth, physically appearing to be around sixteen or seventeen years old, at which point she will stop aging and live to an unknown extent. It is also stated than when Christmas season starts, Nessie had many gifts in hand including an MP3 player from her father Edward, a locket from her mother Bella (inscribed with the words "plus que ma propre vie" which means More than my own life in French), and her handwoven charm bracelet from her Jacob which is the Quileute equivalent of a promise ring. She learns faster than she grows and acquires the ability to speak rapidly, though she prefers to just show people what she wants. While Bella, Jacob and Renesmee are in the woods hunting together, they are spotted by Irina, a member of the Danali coven, who is mad at the Cullens for not avenging her mate's death. Irina saw Renesmee and took her as an immortal child, that is a child turned into a vampire. Because of their inability to control themselves, they are not allowed to exist, and Irina, whose mother had been killed for creating one, informs the Volturi of her. Irina is not aware, however, that Renesmee is a vampire/human hybrid, growing and learning. The Volturi make the decision to come to Forks, and destroy the child. Alice sees this in a vision and decides to see if she can find help by looking for something she can't "see". She tells the Cullens they need to prepare witnesses, and leaves a clue for Bella to figure out how to get Renesmee and Jacob aliases (from J. Jenks, Jasper's friend), and then flees with Jasper. She also leaves clues to make it seem like there's no hope for at least Bella and Edwards. When the Volturi show up, the Cullens have gathered witnesses from all over the world, who have seen what the child is. Though at first, the Volturi are ready to kill, they soon see through all the people willing to protect the child that she is special and should not be harmed. The deal to let her live is set when Alice shows up near the end of the trial with a mature half-vampire like Renesmee, one the Volturi have never known of. Said hybrid, Nahuel, informs the Volturi on his past, his age and his diet. They no longer see Renesmee to be a threat and leave. Since Jacob imprinted on her in Breaking Dawn, he has acted as a brother to her. As imprinting is how shape-shifters find their soul mates, it is likely that Jacob's feelings will become romantic when Renesmee comes of age. As happened to Nahuel, when she stops maturing at the age of seven, she will look like a seventeen-year-old teenager and cease to age for at least over a century and a half, should everything remain well for the Cullens. In Rising dawn Renesmee finally reaches full maturity, looking 17 years old, but even though Jacobs feeling towards her become romantic, Renesmee doesnt find the same feelings for him. Renesmee is depicted as being very beautiful; even more gorgeous than Rosalie. She has inherited both of her parents exceptional looks, having the facial features of her father Edward, (high cheekbones, straight nose and full lips) as well as his unusual bronze hair color and with her eyes being chocolate brown, just like her mother Bella's were while she was still human. However, she has also inherited curly hair from her grandfather, Charlie Swan, portrayed as ringlets that fall past her waist. She has pale skin, which has a blush to it because her heart pumps blood (though it beats faster than a normal human heart). Her skin is as tough as a vampire's, but her temperature seems to be unusually warm, only a few degrees below that of a werewolf. Unlike her family's skin, Renesmee's skin glows slightly in the sunshine like back-lit alabaster rather than sparkling like diamonds. Due to the blood flowing in her veins and her heart beating, she has red rosy cheeks, shell-pink lips, and pale lavender eyelids. According to "Twilight Breaking Dawn Part 2" Renesmee has auburn curls, thin lips and looks more like Bella. According to "Renesmee's Twin" Renesmee is born with bronze large curls, chocolate brown eyes and pale skintone. Then her curls turn mahogany red and then strawberry blonde. When Renesmee is a middle schooler, she starts dying her hair ginger. Renesmee is depicted as a kind, overwhelmingly intelligent, and fun-loving child. She has a competitive streak that prompts her to accept Jacob's hunting challenges, which keeps her motivated to drink animal blood. As a vampire's mind is highly superior than a human's, Renesmee's mind gets into high gear even before she was born; she finds out that her movements in the womb have been hurting her mother, and tries to stop. She also likes to hear the voices of her parents, and shows affection towards Jacob. After she was born, she learns the vampire laws and limitations very quickly and understands their consequences. She can memorize perfectly anything she sees or experiences, and understands people without much problem. Bella comments that she is already more intelligent than most adults, and has better control over her thirst than any of them. She likes to read books and listen to music, something she shares with her parents. She likes to hear Bella reading bedtime stories, but hates hearing the same ones twice, expecting therefore to hear new ones. Renesmee shows fascination to everyone in her surroundings, despite their different species. She has also shown a selfless side, such as when she blamed herself for causing trouble to her family merely by existing, or when she takes Kate's advice to help her mother, despite Bella's protests. According to "Renesmee's Twin", Renesmee is very very arogant, jealous and spoiled. She is often lying to her parents to attract their attention to her. She hates her sister Genevieve very much, because Gennie has a normal life and Nessie is still growing faster. In "Welcome to 5th Grade! ", Renesmee turns 5th grade into a nightmare and turns into one of the popular students. After joining a dance show in "Middle School Life" and meeting Ashley, she dumps her old friends and becomes Gennie`s friend. They turn very close and Renesmee helps her sister to discover her gift. Renesmee can survive on either human food or blood. She doesn't like human food much and will rarely eat it. She doesn't mind drinking animal blood in order to conform to the Olympic Coven lifestyle and due to her love of humans. However, like most vampires, she prefers human blood and sees the donated blood that Bella drank while pregnant as an acceptable compromise. Given the difficulties involved in acquiring enough donated blood and in order to encourage Renesmee to drink animal blood, Jacob Black would start a friendly hunting competition between them for the biggest prey, which keeps Renesmee motivated. Renesmee, often called "Nessie" for short, is a vampire-human hybrid. Similar to Alice's inability to see the future of werewolves, because she was never one herself, she also cannot see Renesmee. This is something that annoys her as much as the fact she can't see the wolves. She is immensely beautiful, and her body temperature is slightly higher than a human. Renesmee has a rapidly beating heart and veins filled with her own blood. Her hardened skin glows faintly rather than sparkles like diamonds upon exposure to sunlight, which allows her to fit into the human society much better than vampires. Unlike the rest of her vampire family, she is also able to sleep. However, as a half immortal, she will continue to grow until her full maturity at the age of about seven, at which point she will appear to be about seventeen (like her father Edward) and will cease to age (as shown by Nahuel in Breaking Dawn). Unlike Nahuel, she is not venomous, a possible trait of female hybrids. Her attractive traits and kind nature draw people (vampire or human) to her. Tanya once commented her as a "special little one, hard to resist". As a baby, Renesmee grows at an outstanding rate; this information caused great worry to the Cullens as they were unable to tell her future, most of them worried that she would have short living years. This worry comes to an end when Nahuel, another vampire-human hybrid, arrives in Forks and explains about his and his half-sisters' experience on the matter. It is implied that Renesmee's growth will slow down until it ceases at the age of seven, making her look like a seventeen or so year-old woman, by which time she may very well live for centuries, if not more. In "Renesmee's Twin", Nessie is growing faster than her sister when they are babies. She looks older than her sister (however they are same aged psychically) and at age of 8 months old she is mistaken with a 12/13 years old girl, because of her height, teen voice and acting like a teenager. Renesmee hates that she is a fast growing child. She even tries to commit suicide in "Renesmee's Twin" because of her fast growth. "I sat on the floor. The blade touched my pale skin and a few tears ran down my cheek. I didn't know that it hurts so much!" - Renesmee when she tries to commit suicide in "Renesmee's Twin"
Being half-vampire, she displays the same supernatural senses and capabilities of vampires. As a three month old, she can already leap 15 ft into the air. According to Edward, her skin is seemingly just about as impenetrable, but no one has yet tested this idea. She is born with sharp teeth that allow her to bite through skin and drink blood, but is not venomous. According to "Renesmee's Twin", Bella thinks that Nessie is an indigo child. As the offspring of two gifted vampires, Renesmee shows the exact opposite of her parents' gifts; while Edward can read people's minds from a distance, she can place her own thoughts and images (even feelings) into their minds, simply by touching them. This power is effective in communication; and while Bella acts as a mental shield that blocks people out from her mind, Nessie can penetrate shields, making her the only person whose mental power is immune to Bella's blockage. Also, she can unconsciously use this power when she is asleep, allowing people to see what she is dreaming. It is yet unknown how this opposition came to be. Renesmee is the biological daughter of Bella Cullen (née Swan) and Edward Cullen,as well as biological granddaughter of Charlie Swan, Renee Dwyer, Edward Sr. and Elizabeth Masen and step-granddaughter of Phil Dwyer and great granddaughter of Marie Higgenbotham, and Geoffrey and Helen Swan. She is also the adoptive granddaughter of Carlisle and Esme Cullen, adoptive niece to Rosalie and Jasper Hale, and Alice and Emmett Cullen, and Gwyneth cullen and Spike Cuther biological mother of Libby Black and wife of Jacob Black, grandmother of Remy Leibe and mother-in-law of Lucas Leibe Renée and Phil and Remy Leibe are the only ones unaware of her existence. She is played from Mackenzie Foy with body doubles. In some fanfics she is played by Bella Thorne. Another adorable version for little Nessie is younger Mahtob Mahmoody (Betty Mahmoody`s daughter).